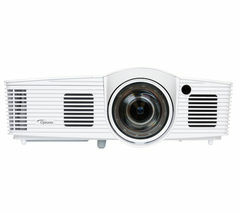 Screen size: Up to 300"
Projectors are designed for use with laptops, PCs and smartphones. They’re used by students and teachers for presentations and can create an incredible viewing experience when used to project films. If you love watching films and have a home cinema set up, a small screen isn't going to cut it. Adding a projector will allow you to see your favourite films the way they were meant to be seen – on the big screen. You’ll be blown away by how good films and TV shows look when you project them on your wall. 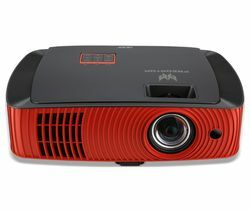 Projectors come in a variety of different sizes, including high power versions for bigger spaces and smaller versions for education and presentations. If you dream of hosting film nights for your friends, a projector will impress your guests and ensure everyone can see the picture no matter where they’re sitting. Portable projectors will allow you to show spreadsheets and PowerPoint presentations wherever you are and if you’re looking for long lasting and high-quality projector, take a look at our range of Epson projectors. Whether you’re looking to upgrade your current home cinema or you’re looking to take your viewing experience to new heights, a projector is the ideal solution. Please complete your details. We'll only use these to contact you about this item. Title Mr. Mrs. Miss. Ms. Dr.
To show you Currys PC World stores local to you, all we need is your postcode.